Learning disability is a neurological disorder that includes several different areas of brain functioning such as reading, writing, spelling, remembering, reasoning and organizing information. Put in layman’s terms, learning disability is just a different way of ‘wiring’ of the brain in some people. In no way does it imply that the person is any less intelligent than the next person. Learning that your child has learning disability can sound very scary at first but if you pause and look around, you will find that there are a host of very successful people out there who have made it in life despite having learning disabilities! Highly respected people like Albert Einstein, Alexander Graham Bell, Winston Churchill, Walt Disney, Whoopi Goldberg and a former Vice President Nelson Rockefeller all had similar problems, but it didn’t affect their climb to the top. In some cases, children with learning disabilities (LD) are even smarter than their peers; if they are taught in the conventional way, it hampers their mental growth, but parents need to take the time out to understand their strengths and weaknesses and together with the intervention and support from professionals, they can train the child to handle their specific difficulties and grow up to distinguished careers in later life. So if the child is taught in a manner that’s different from the typical school system, the child can learn, with the key word here being ‘learning differently’. There are many kinds of learning disabilities and most students are affected by more than one kind; the degree, frequency and intensity of the disability have to be also kept in mind when accessing the students’ abilities. 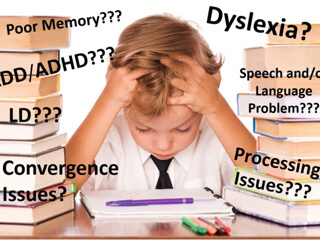 Major types of LDs include dyslexia (reading difficulties), dyscalculia (mathematical difficulties) and dysgraphia (writing difficulties); Auditory and Visual Processing Disorders (difficulty in understanding language) and Nonverbal Learning Disabilities are some of the other challenges a child with LD may have to face. LDs first get noticed when the child has problems in speaking, reading, writing, solving a math problem or paying attention in class. There are many kids however who develop a smart way of covering up their learning issues and the disability only pops up during the teen years when schoolwork is more complicated. It’s still unclear how LDs develop, but some theories postulate it could be due to genetic influences where disabilities run in the family, brain development, both before and after birth and also due to environmental impacts whereby environmental toxins or poor nutrition lead to LDs. Although a diagnosis of LD is upsetting, it’s actually the beginning of treatment for your child’s disability; you now know that your child needs a special tutor to train him in learning skills that will help him cope-up with regular school classes. As there is no cure of LD and it’s a life-long situation, it’s never too late to get help and start adapting.